Stockholm opens with Ethan Hawke donning a disguise. He's decked out in a leather outfit, black-haired wig, and has dyed his handlebar moustache. He packs a duffel bag of weaponry and walks into a central bank in Sweden. He shoots into the air with panache, sending the horrified bank patrons running for safety. When the Swedish police respond, they are stunned to hear his demands. He wants money, but also the immediate release of the well-known bank robber, Gunnar Sorensson (Mark Strong). The Stockholm police chief (Christopher Heyerdahl) is perplexed by the motives of the robber. He let everyone escape, but kept two female bank employees as hostages. Noomi Rapace co-stars as Bianca Lind. She never loses her cool as the robber flamboyantly interacts with police. Bianca's terrified, but her countenance calms her hostage colleague (Bea Santos). Bianca realizes that the robber is concerned with her safety. They develop a strange rapport as the situation becomes critical. Stockholm works when the lead characters interact in the bank. 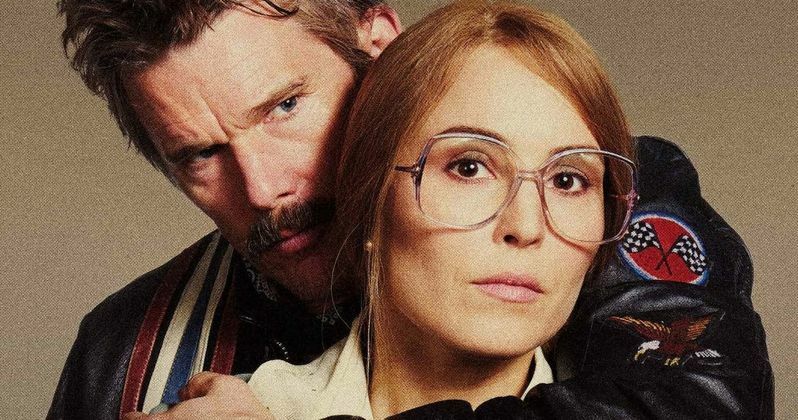 Ethan Hawke and Noomi Rapace are magnetic in a volatile situation. She's not a shrinking violet. He respects her strength, as he freestyles with the police. Robert Budreau does a great job building up their relationship. It's a twisted dynamic that unfolds in a believable way. You can feel the sexual tension rising between the characters. Bianca's fear, the robber's attentiveness, it turns into an aphrodisiac for them both. Noomi Rapace delivers a wide-ranging performance. Stockholm loses focus when it incorporates the situations outside the bank robbery. The police and political response seem scattershot. Robert Budreau constantly reminds us of the unexpected nature of the event. Sweden had never experienced anything like this. News media intercuts the action with updates. Crowds gather as the cat and mouse games raise the stakes. Stockholm should be rippling with anticipation at this juncture. The intensity inside the bank is never matched by law enforcement. They are so humdrum in their approach. If we're to believe the basic tenets of the plot, the police side should have been riveting. They would have been facing an unheard of crime in their society. The police in the film, even with their period costume design, are completely forgettable. Stockholm is an interesting true story. Ethan Hawke and Noomi Rapace were well cast as the misguided captor and his doting hostage. Their time in the bank vault outshined the other subplots in the film. I completely lost interest in everything except for Ethan Hawke and Noomi Rapace's scenes. Stockholm is distributed by Smith Global Media.